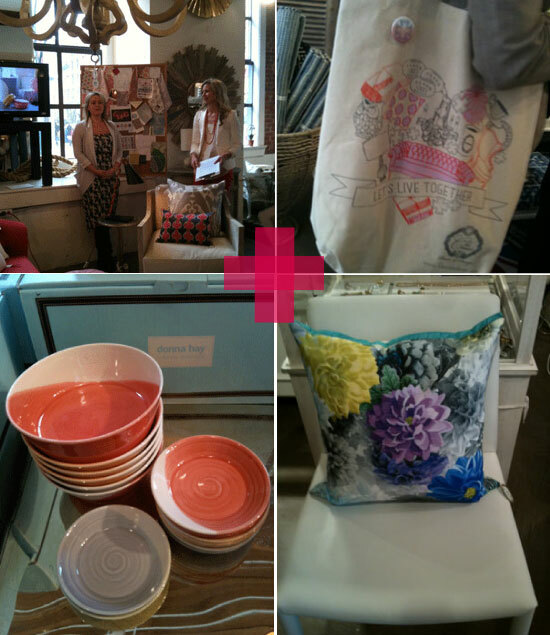 Just a few of the pretty things I spotted at The Cross from their spring event today. After an inspirational presentation on spring fabrics and colours by Megan and Stephanie, I took a look around the shop which was filled to the rim with goodness! My favourites (although too many to mention); a floral cushion on a Saarinen chair, a wire lace-like coffee table, bird cloche bell jars, the Josephine Tufted Sofa, and Royal Doulton tapas plates. Thanks to Megan, Stephanie and everyone involved for a lovely event and treats and that (banana bread to die for)! Related: If you missed it this week, check out the beautiful behind-the-scenes photo shoot Janis posted here, beautiful scenery and colours! Pssst! Cross layout inspired by this post by Anna Dorfman of Door16 (thought it was perfect for this post)! I can see why you had trouble picking favourites. Everything is lovely! Goody goody! Lovely flowery cushions!